Alternative power, or "off the grid" electricity involves the production of 230v electricity from a combination of sources such as, diesel generation, solar, wind with battery storage. Our systems are orientated towards industrial applications such as ski fields, remote high sites and industrial projects with no or limited access to mains electricity. A popular system used by several generator based customers, is our 1.5 - 2kW high capacity UPS with solar generation. This allows customers to power their administration equipment and small power tools without the need for the operation of a generator. Batteries are keep charged by 0.6 - 2kW of solar and utilise the generator for rapid recharging when operating. Instead of 100% diesel reliance, the generator is only required when high load equipment is operating, saving considerably on diesel and servicing costs while keeping lighting, network and communications hardware operating up to 24hrs a day. 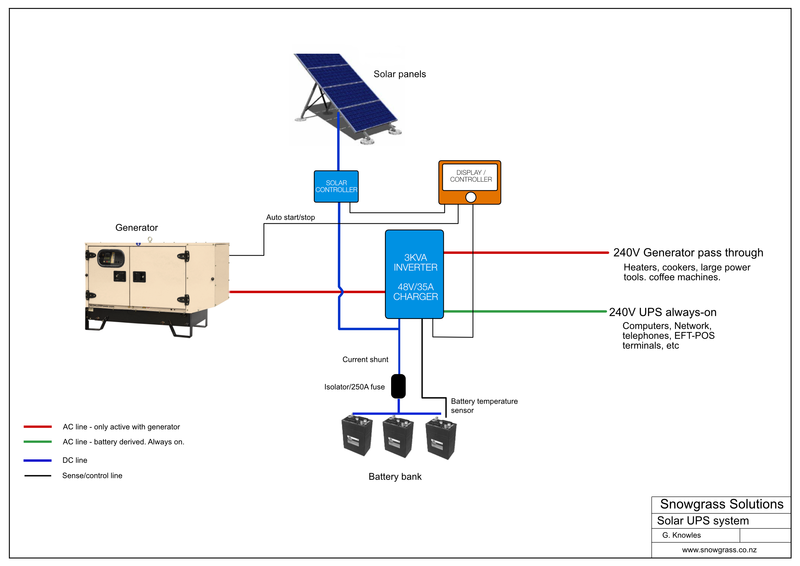 A design for 3KW solar / battery UPS system with diesel generation.